On Monday we were pleased to announce the nominees for the four awards taking place at our Birthday Bash sponsored by Metronet UK on Friday 5th February. The Captain Manchester Award is given to a person with a true Mancunian spirit. Selflessly giving time, money and resources to help to improve the communities across Greater Manchester. Essentially, this person will embody the true spirit of Forever Manchester. The award is kindly sponsored by AutoTrader who have 600 staff based in their Manchester city centre headquarters. Auto Trader sits at the heart of the UK’s vehicle buying process and operates the UK’s largest digital automotive marketplace. Sammi established the “Pay It Forward” page for people to share their stories and acts of kindness, as she was sick of all the doom and gloom on television and in newspapers. Over the time the group has been started there has been some lovely heart warming things people have done. “When I started the page I never expected or thought that the biggest act of kindness so far would be shown to me personally. Recently I had a rather large sum of money stolen from one of my sessions [Sammi runs boot camp sessions in her local community] in which a lot of people paid up front for 6 week classes, this totally devastated me that someone could do this to me as I do a lot for my community and feel I have a good relationship with everyone there. “One morning after things had been posted on my personal Facebook about the theft, people in the community opened a crowd funding page on my behalf and everyone in the community started giving donations, in less than 9 hours everyone had donated more than I had had stolen, I cried all day because of the kindness and comments people were writing about me, it was so overwhelming to know that so many think so much of me and wanted to help me out. “There is an amazing community vibe where I live and I love living here. The pay it forward page I created has shown everyone on it that there are still good kind people in this world trying their best to make people smile. Sammi has developed a network of people who have come together to make a difference in their neighbourhood and her work is going from strength to strength. Krishna is a Forever Manchester Community Ambassador. She received a Cash 4 Graft award of £250 for a Street Party where she shared her talents in cooking Indian Street food with her local community. Krishna has gone on to provide food for various events. One of Krishna’s objectives when she came to the UK was to master the language and immerse herself in her local community without losing her traditional identity. Once the language was mastered her dream was to have a family and follow in her family’s tradition to be a business owner. Krishna never lost sight of dream to be a business owner and this was her next personal challenge. Food has always featured at the heart of Krishna’s life and her passion for cooking for her family and growing number of friends clearly showed. Krishna’s passion was Indian Street Food but understood that some of her Western neighbours thought it was too fattening or spicy. That is where her business idea came from. Krishna wanted to develop a healthy fusion version of her beloved street food to meet the needs of many but at the same time keep it as traditional as possible. Krishna attended a Social Enterprise event and felt that the best way to keep her street food authentic was to be able to deliver it on the street. Krishna needed help from her neighbours to create some new dishes that was a fusion between British and Indian street food. Bombay potato pasties were a huge favourite neighbours and Krishna developed a way to bake rather than fry a lot of her street food so that it would also be healthy. Krishna then purchased a second hand van with the intention to kit it out and run her business from it. Krishna obtained a Cash4Graft award of £250 to hold a street party to get to know the rest of the community and to introduce them to her Fusion Indian Street food and get their comments. The day was a great success. Her new community friends loved her food and those community connections have stayed. Krishna has thought nothing of attending other events in the community bringing along a batch of her almost famous Bombay Pot Pasties for people to share. She will often not accept payment for them as she sees this as building her community and “to feed is to build”. Activities and engagement opportunities involve performing arts, audio production and broadcasting opportunities alongside social development experiences including: Artist development incorporating creative music making and studio recording experiences through the ‘Melody Maker’ initiative. Radio production and broadcasting activities though a 24 hour radio station LDOK.net and exciting social engagement and life skills development opportunities at ‘Frogtastic’ a nationally recognised, multi-award winning club night. These initiatives enable opportunity, encourage inclusion and recognise the equality of people affected by disability with specific emphasis placed on the provision of performing arts and social development activities for adults from the learning disabled community from across the Greater Manchester area. Terry was awarded the MBE for services to the community in 2005. 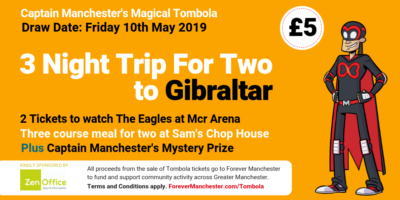 He has been an ambassador for Forever Manchester for the last 3 years and has developed innovative fundraising events such as Comedy Nights to fundraise for FM. He also hosts the Forever Manchester Radio Show every Wednesday afternoon where FM donors and supporters are invited on to the show to talk about their company, support for FM as well as featuring groups funded. The skills, confidence and personal development of the young and subsequently older people Terry works with in his projects is great. They gain confidence, are able to develop skills in an arts environment that they would otherwise not be able to do and make friendships which provide them with a richer life. Sylvia is a key member of Clifton Monday Club. Sylvia helps to organize activities for the Clifton Monday Club. She makes everyone feel welcome and really helps members to make friends and come together to take part in all their activities. She is always thinking about how the group can develop and is very aware that they need “young blood” to keep going to keep membership numbers up and also provide a good variety of activities for their members. She always wants to do more event though she is in her 80s and is now involved with Forever Manchester as a Community Ambassador. Her spirit and good nature is an example and she is keen to do more in the community and represent the older generation when working with Forever Manchester as a Community Ambassador. Alan Townley has been a Forever Manchester ambassador for 5 years and is in fact FM’s longest serving ambassador. He arranges an annual golf day at High Legh golf course inviting corporate and individual supporters to participate. He regularly introduces businesses to FM for us to approach for corporate donations. Each year FM hosts an event called the Lock Down at a supposedly haunted venue in the city centre and people have to vote people out. A few celebrities participate and also FM ambassadors. They do remarkably well and Alan raised £3000 this year at the event due to his popularity and being knows as an ambassador. He is a thoughtful ambassador. When he attends ambassador meetings he always volunteers to help and thinks of ways in which or any of his contacts can help. Over the last 5 years he has fundraised over £25,000 for Forever Manchester. He wears his Forever Manchester badge with pride and is a passionate Mancunian and genuinely believes in Forever Manchester and supporting communities. To see the full shortlist announced on Monday click here. If you’d like to attend our Birthday Bash and support our award winners as well as celebrate everything great about Greater Manchester you can do so by purchasing tickets using the form below or requestion and invoice from Cheryl Hill at cheryl@forevermanchester.com. Individual tickets are priced at £85 and tables of 10 are priced at £850. Please note when booking online, there is a small Eventbrite fee.